Ahoy there ship mates! 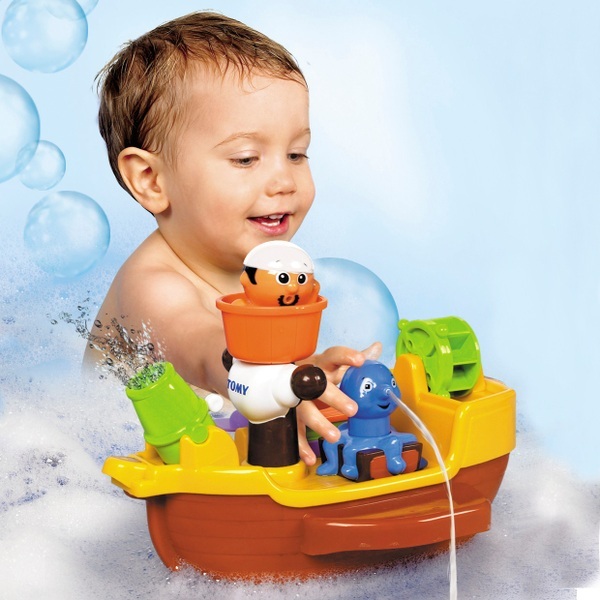 Sail the high seas and have lots of bath time fun with Pirate Jake aboard the Tomy Pirate Bath Ship. Pirate Jake can climb the mast for a bird's-eye view over the bubbles. His playful octopus is ready to give a quick squirt to any unwelcome visits. For a more masterly blast of water Pirate Jake merely needs to activate his big red cannon at the helm of the Tomy Pirate Bath Ship. Uh-oh enemy gaining ground? Quick add more water to the big spinning wheel for extra power. And if all else fails for our loveable Pirate he can also climb into the getaway dingy and launch himself into that wet and bubbly ocean. Man overboard!